Theory and practice with Maxymizely. On the example of our system, Maxymizely, my answer is: to increase a number of paying visitors. What are my website goals? Goals come from your business objectives and are mostly strategic in nature. They should be expressed as simply and clearly as possible. 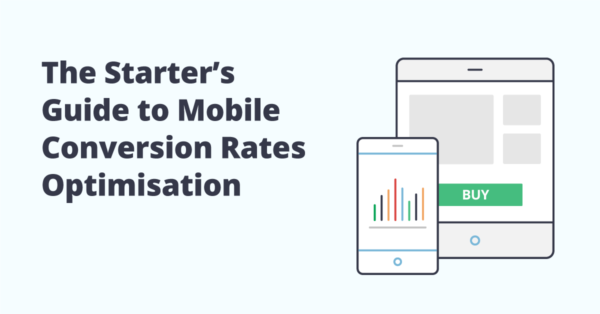 Goal #1 – to increase clickthrough rates on a sign-up button. Goal #2 – to reduce our payment abandonment rate. What are my Key Performance Indicators? KPIs are numbers. 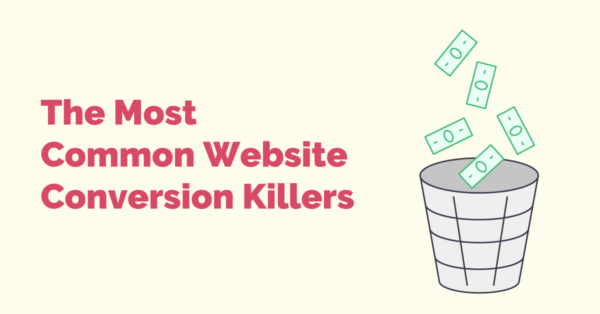 These numbers are metrics that help you understand how well you are following your objectives. What are my target metrics? In practice: to get 10000 paying visitors for Maxymizely for a month. Now, if you’ve made up your mind to do the A/B test, being able to answer all 4 questions above, you are ready to the technical site of this task. I won’t go through a complete flow of creating A/B test, you can watch it here if interested; I want to pay your attention only to some unknown or unstudied terminology, functions, and their importance. I’ll use Maxymizely again to illustrate you my point. On the first step of A/B (Multivariate or Split) test creating, you will see the notion of Engagement. 1.Engagement – to put it shortly, it’s a goal for lazy users. If you don’t have time, you are not in a right mood :), or any other reasons are present, you can still launch your A/B experiment with a Maxymizely default goal, Engagement. 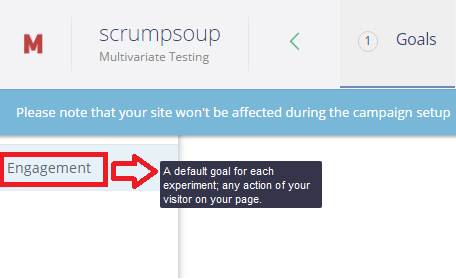 If you leave it as it is, Maxymizely tracks all actions of the visitors on your page. The experiment won’t be specific or targeted. Anyway, I wouldn’t recommend leaving such default goals in your experiment if you take it seriously. Take some time and define a short list of specific actions you expect from you visitors (I promise, there won’t be too many of them) that will turn into your clear and specific goals. Another stumbling-block might be a notion of 2. 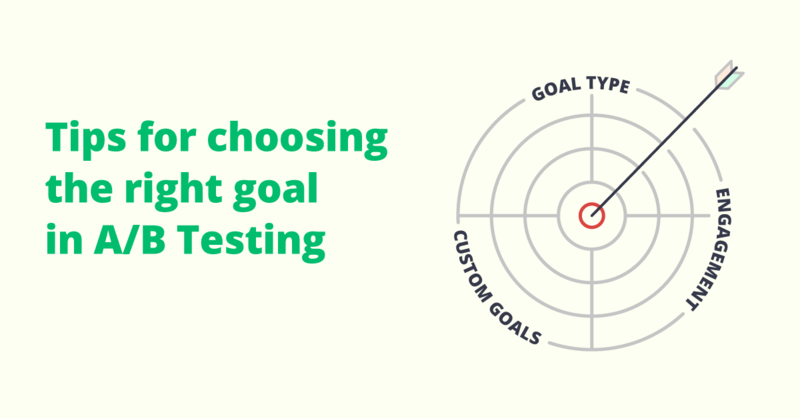 Custom goal in your A/B test. In practice: you set a custom goal when, for instance, you want to track the amount of purchased items, while your Buy buttons redirect visitors to different sites. 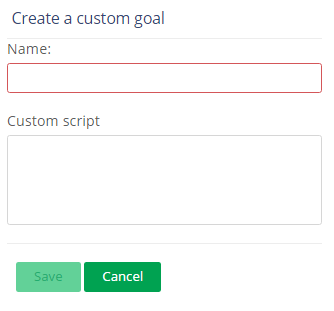 After you’ve entered your custom goal name, Maxymizely offers a custom script automatically. Thus, all purchses from your site, even being redirected to different sources, are still being tracked. The next notion, I want to stop at is 3. Goal type. 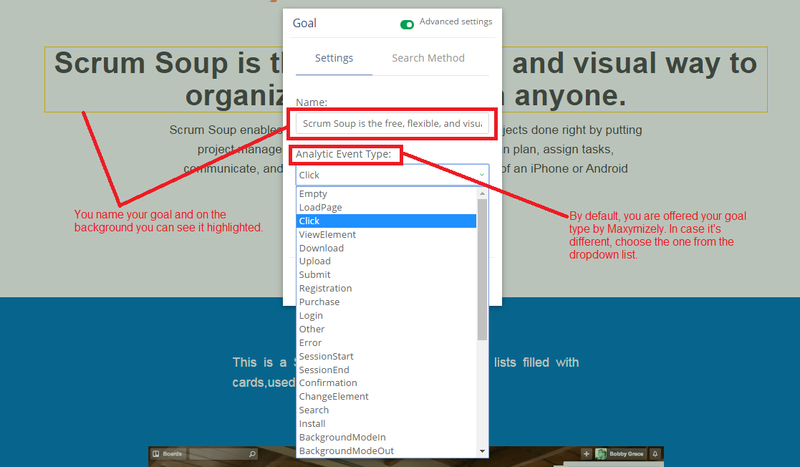 After you’ve right clicked on the item you want to set as a goal, in advanced settings on, besides the goal name (by default, Maxymizely offers some name), you can see a long list of your goal types. As usual, Maxymizely offers some action by default, however, be attentive and use your own brain if Maxymizely hasn’t guessed what action you`re expecting from your users to perform on the selected item. To conclude, I want to inspire you to try an A/B test yourself. It’s quite intuitive with Maxymizely as a bunch of tech gigs have been working hard to enable you to spend little efforts and time, and do it. Sign up here, check demo, and give it a go!